This 6 bedroom, 4 bathroom villa has fantastic sea views and a large private pool and garden. Originally an olive press and family home, Villa Mangana is ideal for anyone wanting to experience a taste of traditional Greece! The beach and tavernas of Kalami are within a 5 minute drive, and if you can tear yourself away from this superb setting, it's also the ideal base from which to explore the island by car or boat. Air conditioning/heating in the bedrooms, pool heating and WiFi are included. Villa Mangana is a great choice for anyone looking for an authentic Greek villa, and the views are simply stunning. Villa Mangana has a fantastic pool terrace, exterior dining area and swimming pool, all with splendid views. The paved terrace extends around the whole house providing plenty of space to relax. There are also 2 shaded areas for dining and a large brick BBQ. Steps from the terrace lead down to the spacious lawned garden and private swimming pool which has panoramic views through the olive trees to the sea and mountains beyond. Shallow steps from the parking area lead up to the villa entrance. Villa Mangana is a cool, comfortable and spacious family villa. The living area is split level with the dining table and chairs being raised from the lounge, under a traditional high beamed ceiling. The original olive press still remains in the lounge as a wonderful original and authentic feature. From here, a separate entrance leads to the parking area and terrace. The kitchen is at the rear of the living area and is fully equipped with a small breakfast table, ideal for an early morning tea or coffee. The kitchen also has access to the parking area and BBQ terrace. The first floor of the house has a second seating area with a small terrace and views of the sea, as well as 2 large doors out onto a beautiful stone staircase outside that leads down to the BBQ and pool area below. On the ground floor is a double bedroom overlooking the neighbouring olive groves, 2 twin bedrooms and 2 shower rooms. One of the twin bedrooms has patio doors onto a small side terrace. A spiral staircase leads upstairs. On the first floor is a second double bedroom with an en suite bathroom, each with a balcony and views over the olives groves towards Corfu Town. There are also 2 twin bedrooms sharing a separate bathroom, each bedroom with a private balcony and superb scenic views across Kalami to the sea. This villa is registered and licenced by EOT Greek licensing association. This number is: 0829K10K422000. Commanding excellent scenic views from its hillside position, Villa Mangana is very close to the beach and facilities of Kalami. Alternatively, the small but very pleasant Yialiskari Beach is around 20 minutes away on foot. Villa Mangana also acts as a great base from which to explore the island. The bay and centre of Kalami is around 15 minutes' walk from Villa Mangana. Kalami has a small choice of shops where you can browse for souvenirs to take home, or buy essentials to cook up on your very own BBQ at the villa. Kalami is a picturesque seaside village with a good selection of tavernas, bars and cafes, most overlooking the bay. The resort has a long pebbly beach and its sheltered, clear waters are perfect for swimming and snorkelling. Alternatively, just simply admire the view from the shade of a beachside taverna. Yaliskari is a small pebbly beach on the way to Agni and about a 15 minute walk from the villa. Agni has a few waterside tavernas, or for the more adventurous, the coastal path continues past Agni down to Kaminaki. There are 3 waterparks on the island. The Hydropolis Waterpark in Acharavi is 25 minutes away by car, and the Sidari Waterpark and Aqualand are both around 40 minutes' drive in either direction of Kalami. The small but delightful village of Kouloura is a pleasant 30 minute walk from the village, on the other side of Kalami Bay. Here there is an excellent taverna overlooking the yachts in the harbour. 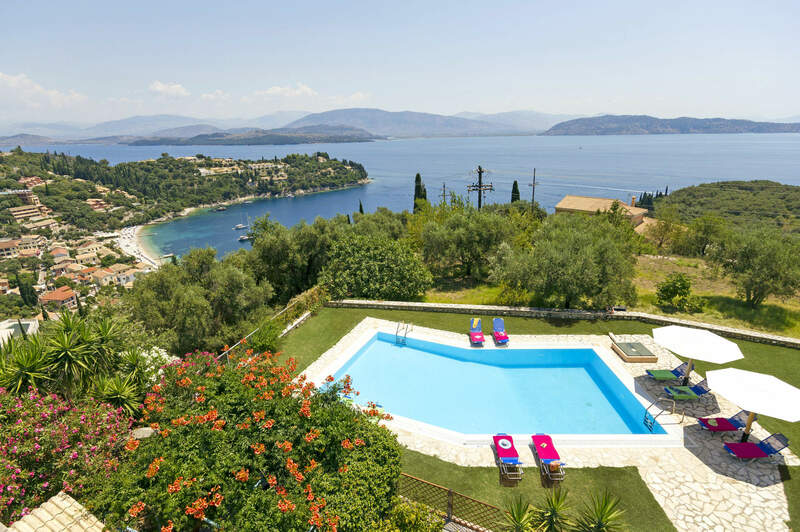 Villa Mangana is also ideally located, with many of the resorts and villages in the North of the island within easy reach by car, including Kassiopi, Nissaki and Agni. The popular area of Paleokastritsa as well as Corfu Town are also well worth a visit, both reached within an hour by car. Corfu's golf course is located in the Ropa Valley on the West of the island, around an hours' drive from the villa. Kalami has a choice of water sports on offer as well as boat trips and boat hire which is a very popular way to explore the island. Villa Mangana is not available to book for season as it is sold out. Take a look here at the Corfu villas that are currently on sale. Villa Mangana exceeded our expectations, certainly did not disappoint! Great location, everything there to ensure our comfort. Great cleaner, and general service. 14 of us went, including 6 grandchildren aged 1-7 yrs - perfect for us. Great pool, great nearby beaches. Thank you for a marvellous holiday - fully recommend to my friends. This is a lovely, well maintained villa, with a great pool, great views and great facilities. We'll try to come again.